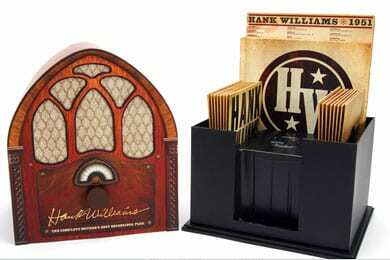 The Hank Williams box set is showing up on numerous best of 2010 lists, earning raves from the Washington Post and CMT.com’s Chet Flippo. The meticulously compiled project won a Pulitzer Prize in May, and is nominated for a 2011 Grammy for Best Historical Album. Hank Williams: The Complete Mother’s Best Recordings…..Plus! is culled from his 1951 Mother’s Best radio show on Nashville’s WSM. The recordings, which were nearly thrown away in the 1970s, include his versions of chestnuts like “Blue Eyes Crying in the Rain,” “Cool Water,” and “On Top of Old Smoky,” as well as his own classics, such as “Cold, Cold Heart” recorded just days after it was written. Joining Williams on the live show were his wife, Audrey, and his Drifting Cowboys band. The set reveals a seldom seen side of Williams’ personality, with him talking openly between songs about his life and career. There’s also a bonus DVD featuring a conversation between Hank’s daughter Jett Williams and the two surviving members of his Mother’s Best group. The set comes with a 108-page book that includes a Foreword by Hank Williams, Jr., an Afterword by Jett Williams, a 25,000 word essay by Colin Escott, and many previously unpublished photographs from the collection of Marty Stuart. Joe Palmaccio, who won a Grammy for his work on The Complete Hank Williams, handled audio restoration for the Mother’s Best set.